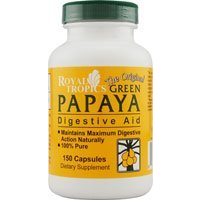 Royal Tropics: Green Papaya. Papain is a milky juice, which is found only in the green papaya fruit. 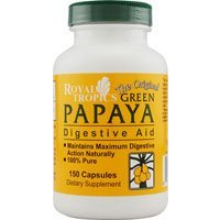 Used internally, papain is very effective in the treatment of indigestion originating in the stomach or intestines. Papain transforms proteins into peptones, which are more easily absorbed into the bloodstream, thus facilitating protein assimilation and improving digestion.